Available in 2 color options. Click any of the 'Buy It' links below to see the color options available at each store. A blunt, squared toe completes the lived-in look of a cleanly styled boot that evokes a utilitarian vibe. Style Name: Ariat Rambler Boot (Men). Style Number: 380369. Available in stores. Bare bones and broken in, the Ramblers are good to go from Nashville to L.A, Austin to Boulder. They fit right with the support of ATS technology, and the Duratread outsole absorbs the road's shock. Size: 13 2E. Color: Brown Bomber Full Grain Leather. Gender: Male. Age Group: Adult. Medium width Leather upper Rubber compound outsole 11" boot shaft Square toe Approx. 1-1/2" heel. 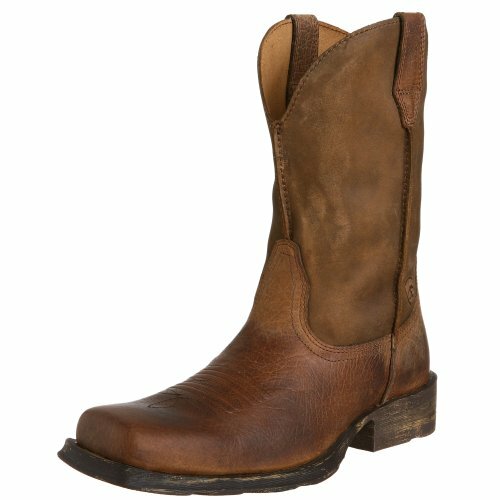 Fashion > Footwear > Mens Footwear > Mens Boots > Western Boots-MN. Shoes > Men's Shoes > Boots. Store: BootBay Co. Condition: Brand New Price: $149.95 Total Price: $149.95 Buy It from BootBay Co.
Ariat Rambler Recon Boot - Men's -- Free 2-day Shipping On $50+ Orders! Store: hawkfanatic31 Condition: Brand New Price: $142.30 Total Price: $142.30 Buy It from hawkfanatic31 No returns. Last updated: April 20, 2019 at 11:41 EST. Pricing information is provided by the listed merchants. GoSale.com is not responsible for the accuracy of pricing information, product information or the images provided. Product prices and availability is subject to change. Any price and availability information displayed on amazon.com or other merchants at the time of purchase will apply to the purchase of the product. As always, be sure to visit the merchant's site to review and verify product information, price, and shipping costs. GoSale.com is not responsible for the content and opinions contained in customer submitted reviews.